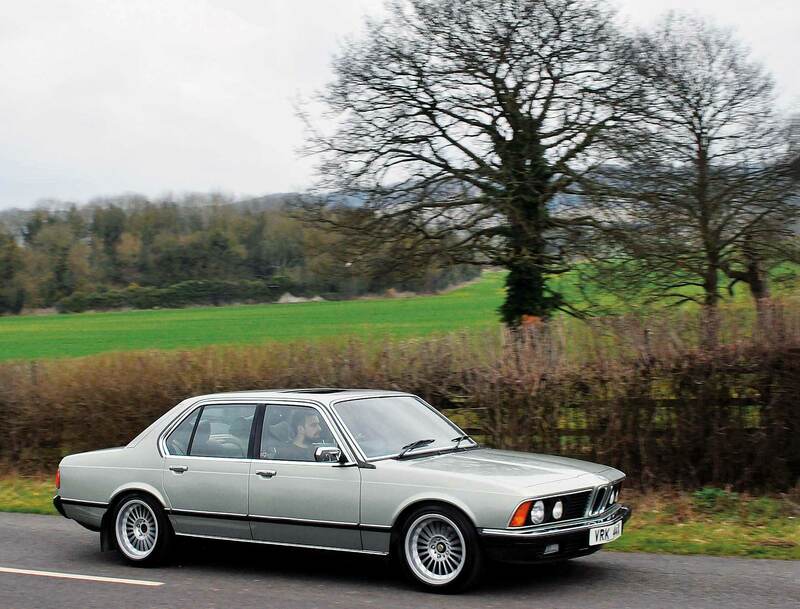 Chris Graham meets Ian Hodge, a BMW enthusiast and track day fanatic who, much against his better judgement, went out and bought a 1981 E23 7 Series! Magni­cent Seven. Me and my car Ian Hodge bought an E23 7 Series on a whim and, despite his initial optimism, things got off to a shaky start. 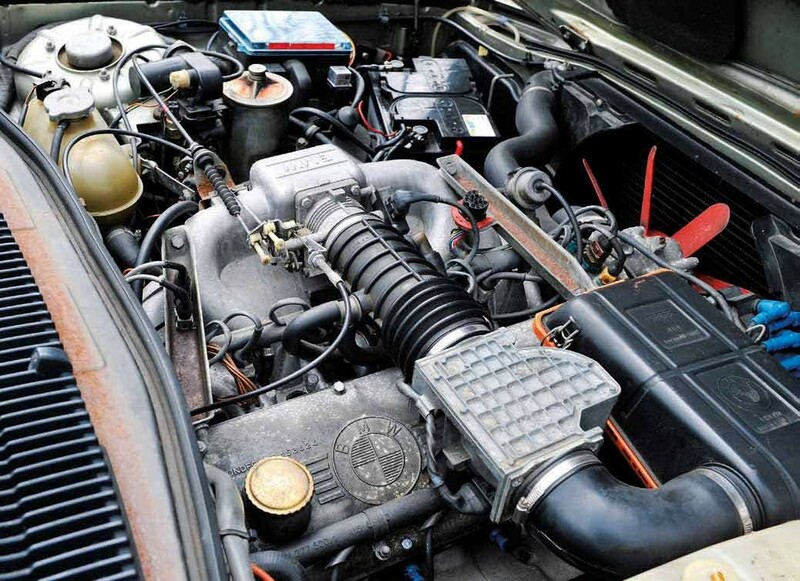 Being a professional mechanic, Ian Hodge wasn’t fazed by the prospect of taking on a 37-year-old car with over 100,000 miles on the clock that was belching out exhaust smoke. Since then, he’s been hugely impressed by the many virtues of his remarkably clean E23 7 Series. Robert Burns’ famous line of poetry which suggests that ‘the best laid plans of mice and men often go awry’, couldn’t be more apt than in the case of Ian Hodge. For it was while searching the internet for a sensible and practical load-lugger, that this BMW enthusiast from Maidstone, Kent, rather took leave of his senses! “We’ve got three dogs now, so my partner, Rhianna, and I decided that an E39 Touring would fit the bill as an interesting and affordable vehicle,” Ian explained to me. “Rhianna is a BMW fan too, so we thought that model would be ideal for transporting the dogs and us in style to the many car shows we go to.” Strangely, though, things didn’t quite turn out like that. Ian’s passion for BMW stretches right back to a specific point in his childhood, which he still remembers well. “One day, back in the late 1990s, I was being driven along in the back of my mum’s Citroen Saxo VTR. As we approached a roundabout, I spotted a white saloon entering the roundabout on the opposite side from us, and was then totally amazed to see it drift majestically past in front of us, then speed off down the road. We followed and it did exactly the same at the next roundabout, and I just thought it was the coolest thing I’d ever seen! Then it was gone. 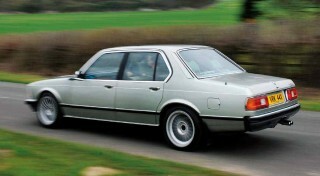 I later discovered that it was a BMW E30 325i Sport and that was it, I was hooked! 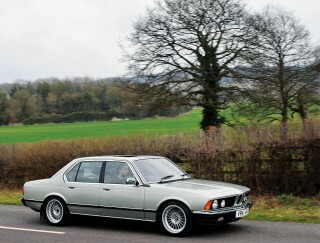 As it turned out, the car was a standard, 1988 325i Touring and the owner wanted a quick sale. Consequently, he was asking just £200 for it. Amazingly, despite having spent the previous six years languishing on a grassy patch in a Littlehampton garden and being covered in green moss, the car was still a runner. Ian couldn’t believe his luck, and the test drive that followed convinced him that it was a car that he just had to have. “I was in my early 20s at that time,” he told me, “and was driving a slow old Ford Sierra Sapphire. 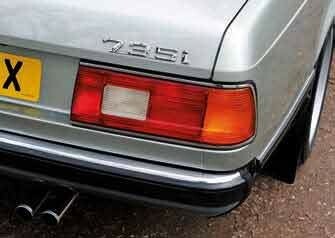 So the performance of the 325i, despite the state it was in, was really exciting. I was happy to hand over the cash and trailer the car home, before the seller changed his mind! “I fitted a set of Gaz Gold coilovers, Minilite wheels and four-pot brake calipers, but that was just the start. 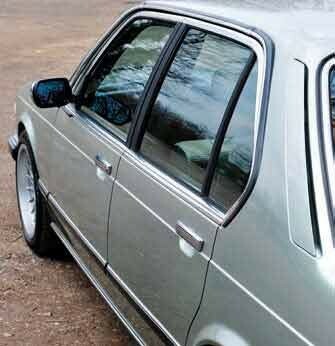 The car’s come a long way since then; the interior’s been stripped, I’ve fitted a full roll cage and installed weight-saving, Perspex windows. 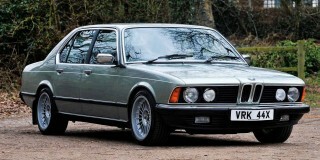 What’s more, it’s now has a 2.8-litre, M52 engine under the bonnet, from an E36. It’s not immensely powerful but it does go well, and remains road legal. My best time around the ‘Ring in it is 8m 19s, which I think is respectable. “Nowadays, I try to get out to Germany at least twice a year, driving the car there and back. Unfortunately, it’s not a great car for travelling long distances; it’s terribly hot inside and you can’t open more than a small slot in the windows, so the four-and- a-half drive from the Calais to the circuit can be an uncomfortable challenge in itself. Often, by the time I get there, I feel like I’ve already competed at Le Mans. But once I’m out on the track, all that discomfort is forgotten. Ian continued: “Anyway, as I mentioned at the start, I was looking for a suitable E39 Touring on eBay, and had been for a month or so. 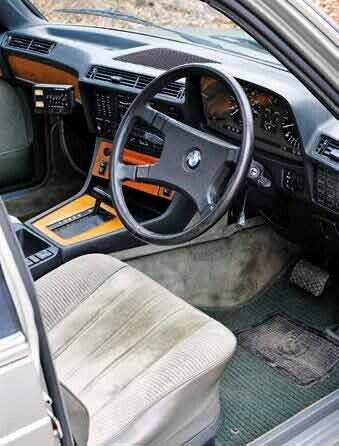 During that time, a car that kept popping up in the ‘You may also be interested in…’ section, was a 1981 E23 735i. It was only up for just over £4,000, but it obviously wasn’t attracting much interest mainly, I think, because the owner – a private seller – had been quite harsh with his description. At that stage, Ian had literally no experience with 7 Series BMWs, in fact, he’d never even looked at one closely, let alone ridden-in or driven one. Evidently, though, the more he thought about that particular car, the more he knew he wanted it. “The owner had sent me about 90 photos detailing all aspects of the car and, although looking at pictures is never the same as seeing a vehicle in real life, they gave me a good impression about what it was like. Also, I appreciated the seller’s honesty; he didn’t shy away from photographing even the slightest of imperfections. “So, the great day arrived and a friend agreed to drive me up to the Wirral. Normally, I’m used to buying my cars from sellers who live on council estates, so you can imagine my surprise when we turned into a long, tree-lined gravel drive, that took us past a tennis court and enormous flower beds. We actually had to stop and ask a gardener for directions! “However, things took a bit of a turn for the worse on the long journey back to Kent. 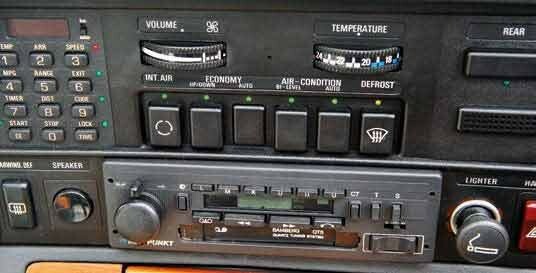 The radio wasn’t working, the temperature gauge only delivered a reading every now and then, and the speedometer was as dead as a doornail. But I knew all this before we set off. What I wasn’t quite so prepared for was a problem with the brakes. All this happened nearly a year ago and, since then, I’m happy to report that things have been a good deal more predictable for Ian and the E23. “Overall, the car’s been running really well and, at the moment, Rhianna uses it more than I do. She’s been running it as her everyday commuting car, although she only has a short drive to work. “As far as the smoking engine’s concerned, the previous owner had mentioned that it was using a lot of oil as well as smoking, and I found the same. However, I’m wondering if he was using the correct grade because, on the advice of a friend, I switched to a decent 10W50 lubricant and it cured the problem almost entirely. “Now the only time I see any smoke from the exhaust is when re-starting a hot engine, which produces the odd puff. So I’m thinking that the valve stem oil seals are probably getting worn, and will need dealing with in due course. As far as oil consumption is concerned, though, I’ve not had to put a drop in since the change of grade, which is great. “I had a crack at the instrument cluster, stripping and cleaning what I could, but that didn’t improve things. So I admitted defeat and packed it off to a specialist reconditioner. 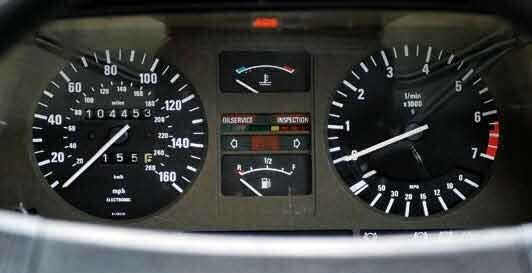 It was returned in decent working order, although the fuel gauge remains a little temperamental at times. As a result I’ve actually run out of fuel once, which was embarrassing! “Other jobs I have planned include replacing the distributor cap and HT leads; there are no misfire issues, but I’ll just feel happier with new ones fitted. I also want to change the transmission fluid and its filter in the gearbox, plus the sump gasket which I’ve noticed is leaking slightly. I don’t imagine that this oil has been changed very often in the past decade or so, so I’m sure it’ll benefit from doing that. “Externally, the bodywork is pretty good, although I can tell that some respray work has been done. The boot lid is a slightly different colour and there’s a small area of corrosion starting to show at the back edge of the front, offside wing to be dealt with. Bodywork isn’t something I can tackle, so I’ll be handing that work over to a specialist. Underneath the car is in remarkably good condition; straight and very clean. I’ve had the carpets up inside, and the floorpans look in perfect condition, as does the boot floor. “So far, the car really has exceeded all my expectations for it and, in many respects, there’s nothing that I’d rather be driving. 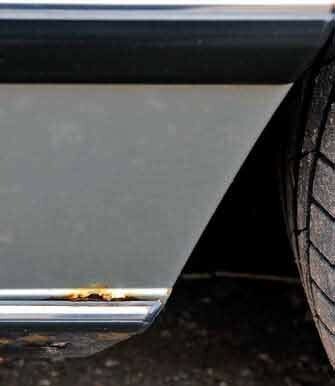 Funnily enough, one of the things that gives me the greatest amount of pleasure are the chrome bumpers. For years I’d wanted a car with them, and now I’ve finally got one! It’s just such a classic feature and really sets the car apart, especially nowadays when such trim is all but non-existent. “My original plan had been to buy the car, do a bit of work on it, use it for a couple of years and then move it on. But the pleasure it gives us both now has changed all that and, to be honest, I don’t think it’ll be going anywhere. Even by modern standards, I find it a remarkably quiet and comfortable car to drive; it’s a really great cruiser, with wind noise only really becoming noticeable at high speed. It’s clear that this particular 735i has found itself a sympathetic and caring home in the Hodge household, and the couple are confident that, given suitable seat coverings, the car will work perfectly well as a dog carrier, too. The E23 is one of those models that sneaks under the radar for lots of enthusiasts, and Ian admits that it had never been a vehicle that figured in his thinking. But now he’s experienced the mix of attractive, understated looks, impressive equipment levels, air of refinement and straightforward affordability of this luxury saloon, it’s a car that’s leaped up in his estimation. The couple are delighted with the E23, and really have nothing but praise for its many, appealing qualities. The E23 7 Series is a great cruiser, and surprisingly quiet. Left: The electric motors are sluggish when adjusting the front seats (and windows), but work well enough. 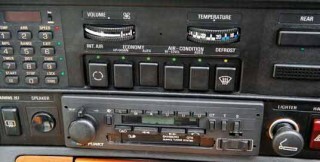 Note the rare, stalk-mounted, Blaupunkt graphic equaliser to the left of the centre console. 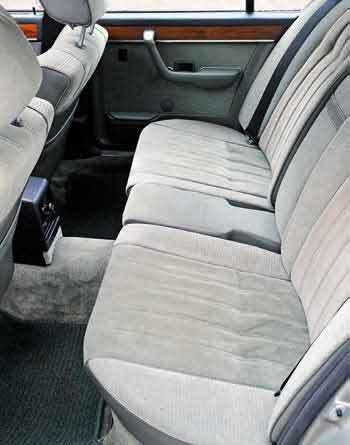 Middle: The rear seats are electrically adjustable, and still function as they should. 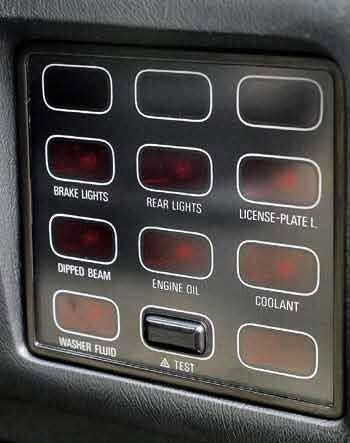 Right: Vehicle check system still fully operational after all these years. 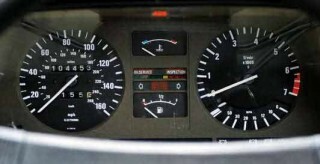 Classic BMW instrumentation; clear and extremely easy to read. The air conditioning is more involved to operate than a modern system, but still pumps out plenty of refreshingly cold air. The car is in remarkable condition, both inside and out, given its age and mileage. Costing a little over £4,000 to buy and after spending perhaps another £1,000 on tyres, brakes and instrument repairs, Ian now has a luxury saloon that owes him virtually nothing. 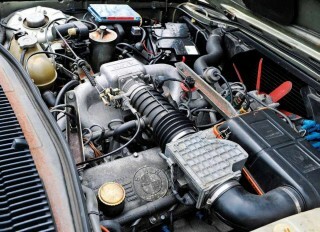 The 3.5-litre M30 engine’s oil consumption issues and smoking exhaust were cured by nothing more involved than an oil grade change. 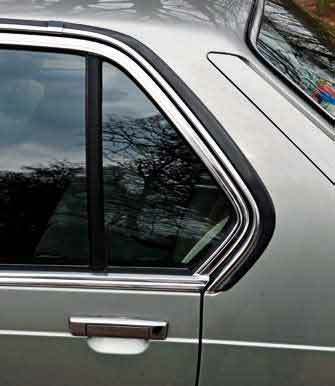 Top: The light, metallic paint and chrome trim really work well together. Above: The only rust to be found on this E23 735i is here, along the bottom edge of the offside, front wing. New springs have sharpened the suspension slightly, and improved the handling.